Kemba Walker’s clock management earns your Heads Up Play of the Day! Appeared in 73 games (all starts) for the Bobcats... 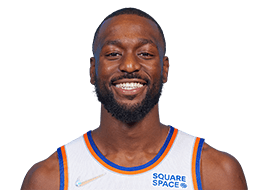 Matched his career high of 17.7 points and set new career marks with 4.2 rebounds and 6.1 assists along with 1.2 steals in 35.8 minutes ... Named Eastern Conference Player of the Week on February 24, 2014 after he averaged 22.5 points, 8.8 assists, and 5.5 rebounds during the previous week ... Posted his second career triple-double with 13 points, 10 rebounds and 10 assists against Orlando on April 4, 2014. Started all 82 games for the Bobcats… Averaged career highs of 17.7 points, 5.7 assists and 2.0 steals along with 3.5 rebounds in 34.9 minutes… Set a franchise single-season record with 160 steals…. Ranked fifth in the NBA in steals, 20th in steals per turnover (0.8), tied for 21st in scoring and 25th in assists… Scored in double figures 74 times, including 30 games of 20 points or more and four games of 30 points or more… Handed out 10 or more assists five times… Recorded five double-doubles… For the second straight season, was the only Bobcats player to play in every game... Led or tied for the team lead in scoring 33 times, in rebounds three times, in assists 65 times, in steals 46 times and in blocks seven times… Recorded four double-figure scoring streaks of at least 10 games, including a pair of career-long 18-game streaks from Dec. 29-Feb. 4 and March 3-April 5… Scored a career-high 35 points on Jan. 21 against Houston... Scored 34 points on a career-high 13 field goals on March 27 against Orlando… Scored 23 points and handed out a career-high 13 assists on Apr. 15 against New York… Had a career-high and franchise-record-tying eight steals on Nov. 10 against Dallas… Played in the 2013 BBVA Rising Stars Challenge at All-Star Weekend, posting eight points, eight assists, two steals, one rebound and one block in 20 minutes. Appeared in 66 games as a rookie for the Bobcats, with 25 starts… Averaged 12.2 points, 3.5 rebounds, 4.4 assists and 0.9 steals in 27.2 minutes… Ranked 29th in the NBA in assists… Ranked third among NBA rookies in assists, fifth in scoring, seventh in free-throw percentage (.789), seventh in minutes played, ninth in steals and tied for 19th in rebounding… Was the only Bobcats player to see action in every game… Recorded the only triple-double by a rookie on the season and the third in Bobcats history with 20 points, 11 assists and 10 rebounds on Jan. 28 vs. Washington… Scored in double figures 44 times, including nine games of 20 or more… Recorded double-figure assists two times and double-figure rebounding once… Led the Bobcats in scoring nine times, in rebounds four times, in assists 26 times, in steals 21 times and in blocks six times… Was one of nine rookies selected to play in the 2012 BBVA Rising Stars Challenge at All-Star Weekend and recorded a double-double in the contest, tallying 10 points, a game-high 10 assists, five rebounds and two steals in 25 minutes… Scored a career-high 23 points on Jan. 14 against Golden State… Scored 13 points and tied a season high with 11 assists on April 22 against Sacramento for his second double-double of the season… Scored in double figures in six straight games twice (Feb. 11-22 and April 3-10)… Averaged 14.7 points, 5.0 rebounds and 4.9 assists in 25 starts. Played three seasons at the University of Connecticut, averaging 16.1 points, 4.4 rebounds, 4.1 assists and 1.7 steals in 111 career games… Led the Huskies to the 2011 NCAA Championship and earned Final Four Most Outstanding Player honors after averaging 23.5 points, 6.0 rebounds and 5.6 assists in six NCAA Tournament Games… As a junior in 2010-11, earned Consensus First Team All-America honors after averaging 23.5 points, 5.4 rebounds, 4.5 assists and 1.9 steals in 37.6 minutes in 41 games played… Received the Bob Cousy Award as the nation’s top point guard… Was one of only two players in the nation to average at least 20 points, five rebounds and four assists… Named First Team All-Big East… Named Big East Tournament Most Outstanding Player after setting a new tournament record with 130 points in five games… Set UConn single-season records with 965 points, 316 field goals, 258 free throws and 1,543 minutes played… Ranked fourth nationally and second in the Big East in scoring… Led the Big East in minutes played, ranked third in steals, ranked eighth in assists and ranked ninth in both free-throw percentage and assist-to-turnover ratio… Scored in double figures in 40 of 41 games, tallying 20 points or more 27 times, including a school-record 11 games of 30 points or more… Scored a career-high 42 points on Nov. 17 against Vermont, tying an XL Center record… Recorded his first career triple-double with 24 points, a career-high 13 rebounds and 10 assists on Dec. 3 against UMBC… As a sophomore in 2009-10, averaged 14.6 points, 5.1 assists, 4.3 rebounds and 2.1 steals in 35.3 minutes per game… Named Third Team All-Big East and to the NIT All-Tournament Team… Led the Big East in steals, ranked second in assists and ranked seventh in minutes played… Scored in double figures in 27 of 34 games, including five games with 20 points or more, and tallied three double-doubles… As a freshman in 2008-09, averaged 8.9 points, 3.5 rebounds, 2.9 assists and 1.1 steals in 25.2 minutes per game… Named to the Big East All-Rookie Team… Scored in double figures 11 times, including four games of 20 points or more… Named to the West Region All-Tournament Team during the NCAA Tournament after scoring a game-high 23 points in the Elite Eight win over Missouri. Full name is Kemba Hudley Walker… The son of Paul and Andrea Walker... Has three siblings, Sharifa Nesbitt, Akil Nesbitt and Keya Edwards… Majored in sociology at the University of Connecticut… During the summer of 2010, was one of 10 collegiate athletes named to the USA Select Team that trained with the U.S. National Team from August 10-13 in preparation for the 2010 FIBA World Championships.